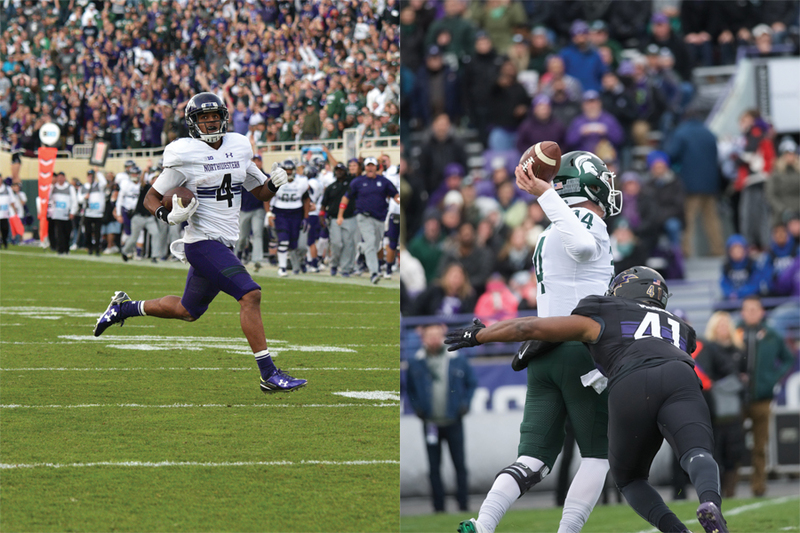 Left: Solomon Vault returns a kickoff for a touchdown in Northwestern’s 2016 win over Michigan State. Right: Safety Jared McGee hits Spartans quarterback Brian Lewerke in Northwestern’s 2017 win. Joe Gaziano just wanted someone to fall on the ball. The defensive end had just stripped Michigan State quarterback Brian Lewerke with the Spartans trailing Northwestern 39-31 in triple overtime. If a Wildcat fell on the ball, the game was over. But Lewerke picked it up and still managed to stay on his feet. “So I’m chasing back after the play, the offensive tackle peels back and blocks me again, and then I’m thinking he’s about the throw it away, he’s about to throw it out of bounds or he’s about to just kind of run out of bounds and try to gain some yards on the ground,” Gaziano said. But Lewerke had other ideas. He turned and fired the ball into the end zone, where it was intercepted by linebacker Nate Hall, who received dozens of stitches in his hand in the middle of the game. The student section stormed onto the field moments after. “At that point, I was so tired through a triple overtime game, I jumped up a couple times, celebrated with the guys on the sideline, and I was so tired, everyone else was rushing the field and I took a knee, trying to catch my breath,” Gaziano said. The game marked the second straight explosive battle between the Cats and Spartans. In 2016, both teams came into East Lansing at 2-3 and in need of a win. Michigan State got off to a fast start and opened an early 14-0 lead, but NU found production from a number of places to get back in the game. Gaziano had a highlight-reel safety, Solomon Vault returned a kickoff for a touchdown and quarterback Clayton Thorson threw for three scores in a wild game that the Cats won 54-40. It was the most points the Cats had scored since a 59-38 shellacking over Indiana in 2011 and a game in which Kain Colter led NU in receiving yards. The 2016 loss left Michigan State reeling, and the Spartans struggled to a 3-9 finish. But in 2017, Michigan State came into Evanston ranked No. 16 in the country. That game was nothing like the high-scoring affair of a year before in East Lansing, as the score was 17-17 after regulation. Statistically, a number of players had huge outputs. Lewerke threw for 445 yards and four touchdowns, while Thorson amassed 356 yards and two scores. Defensively, linebacker Paddy Fisher had an absurd 17 tackles that earned him national recognition after the game. Both recent games against Michigan State proved to be turning points in NU’s season. In 2016, the win brought the Cats back to .500 on the season and helped them reach a bowl game. In 2017, the game produced the iconic moment of the season and also served as NU’s second-straight overtime victory, keeping alive what eventually became an eight-game winning streak to end the season. Gaziano said the game was one of his favorite moments in purple.